Hypersensitivity pneumonitis and hot tub lung typically involve the lungs bilaterally. Individuals with acute hypersensitivity pneumonitis (as exemplified by "farmer's lung") develop symptoms within 2-9 hours of exposure to the antigen. They typically present with systemic or influenzalike symptoms such as chills, fever, sweating, myalgias, body aches, headache, and nausea. Cough and dyspnea may also occur. It has been suggested that subacute hypersensitivity pneumonitis is a variant of acute hypersensitivity pneumonitis in which the symptoms take longer to resolve. Patients with chronic hypersensitivity pneumonitis present predominantly with dyspnea and cough. [6, 7] Fever, fatigue, weight loss, flulike symptoms, and chest discomfort may also occur but are less common. There may be a history of exacerbation of symptoms in certain locations or situations and decreased severity in others. This typical waxing and waning of symptoms is a reflection of exposure to and removal from the source of antigen. The most common physical finding in hypersensitivity pneumonitis is the presence of inspiratory crackles, which can be auscultated in most patients with the condition. [6, 7] Wheezing, cyanosis, and digital clubbing are demonstrable in only a minority of cases. The diagnosis of hypersensitivity pneumonitis is often difficult because of the lack of a well-defined diagnostic criterion standard. 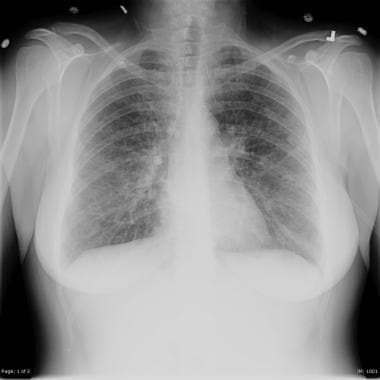 Key investigations to establish the diagnosis include bronchioloalveolar lavage (BAL), pulmonary function tests, and high-resolution computed tomography (HRCT). BAL typically shows a marked increase in lymphocytes and a predominance of CD8-positive T lymphocytes over CD4-positive T lymphocytes, which is a reversal of the normal CD4:CD8 ratio, in which CD4-positive cells predominate. Pulmonary function tests most often show restrictive changes with a decrease in the diffusing capacity of carbon monoxide (DLCO), but some patients may have obstructive changes. [7, 6] Further investigations may include serologic testing for antibodies to various antigens, skin hypersensitivity tests, or antigen challenge tests. Radiographs typically show bilateral interstitial infiltrates, although many patients show no abnormalities on chest radiography. Not surprisingly, CT scans (particularly HRCT) are more sensitive for detection of abnormalities. In classic cases, HRCT shows bilateral ground-glass opacities with fine centrilobular nodules. Another common finding is air trapping that manifests as mosaic attenuation on expiratory films. Some patients may have normal findings, even on HRCT. Radiologic abnormalities are said to be more pronounced in the upper lobes, although a recent large study challenges this assumption. Honeycombing may be present on HRCT in a small minority of patients; these represent cases in which fibrosis has supervened and progressed and can be radiologically indistinguishable from usual interstitial pneumonia/idiopathic pulmonary fibrosis. A case of hot tub lung in a 48-year-old woman with dyspnea and dry cough. This chest radiograph, taken at the time of the initial presentation, shows diffuse bilateral fine nodular opacities. Since acute hypersensitivity pneumonitis is diagnosed on clinical grounds, biopsies are rarely collected. In contrast, the clinical and radiologic findings of subacute and chronic hypersensitivity pneumonitis overlap with other interstitial lung diseases, often resulting in the need for biopsy. The role of biopsy is particularly important when an inciting antigen cannot be identified on clinical investigation or in patients in whom a combination of HRCT and BAL findings does not allow a confident diagnosis of hypersensitivity pneumonitis. 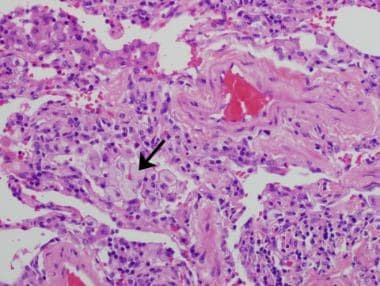 Classic cases of hypersensitivity pneumonitis show a characteristic histologic triad of (1) diffuse interstitial chronic inflammation ("cellular chronic interstitial pneumonia"), (2) poorly formed interstitial granulomas, and (3) tiny foci of organizing pneumonia. [27, 28, 29, 30] Of these, the most striking and consistent finding is a cellular chronic interstitial pneumonia characterized by thickening of alveolar septa (interstitium) by an inflammatory infiltrate composed mainly of lymphocytes and scattered plasma cells, along with an occasional multinucleated giant cell and/or a few aggregates of histiocytes (granulomas). See images below. A case of hypersensitivity pneumonitis in a 48-year-old woman with numerous pets including cockatiels and finches. This low-magnification photomicrograph of a surgical lung biopsy demonstrates diffuse interstitial thickening by a cellular process. A case of hypersensitivity pneumonitis in a 48-year-old woman with numerous pets including cockatiels and finches. At high magnification, one can appreciate that the interstitial expansion is caused mainly by lymphocytes and plasma cells. A case of hypersensitivity pneumonitis in a 48-year-old woman with numerous pets including cockatiels and finches. Lymphocytes and plasma cells are also present in the wall of a bronchiole (chronic bronchiolitis). A 46-year-old man with hypersensitivity pneumonitis. 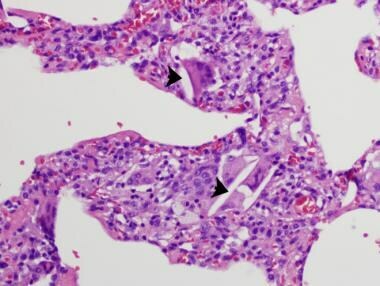 High magnification shows lymphocytes (short arrows) and an occasional plasma cell (long arrow) within the interstitium. Arrowheads are within airspaces. The granulomas of hypersensitivity pneumonitis are easily overlooked. They are usually tiny, loose, poorly formed, and non-necrotizing. Multinucleated giant cells, when present, may contain microcalcifications, cholesterol clefts, and other products of macrophage metabolism that are of no significance other than that they may be mistaken for exogenous (foreign) particles. See images below. A case of hypersensitivity pneumonitis in a 48-year-old woman with numerous pets including cockatiels and finches. 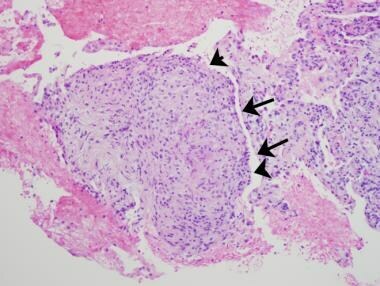 A small granuloma (arrow) is present within the interstitium. 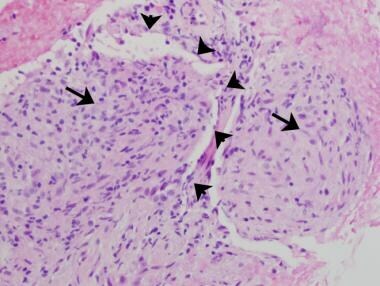 The finding of such granulomas in the context of a diffuse interstitial inflammatory infiltrate is highly suggestive of chronic hypersensitivity pneumonitis. A case of hypersensitivity pneumonitis in a 48-year-old woman with numerous pets including cockatiels and finches. Tiny granulomas (arrows) are barely visible within alveolar septa (interstitium), which show scattered chronic inflammation (arrowheads). A case of hypersensitivity pneumonitis in a 48-year-old woman with numerous pets including cockatiels and finches. Typical loose interstitial granuloma at high magnification. A 46-year-old man with hypersensitivity pneumonitis. This low magnification photomicrograph of a surgical lung biopsy shows diffuse, fairly uniform alveolar septal thickening. Granulomas are not apparent at this magnification. A 46-year-old man with hypersensitivity pneumonitis. 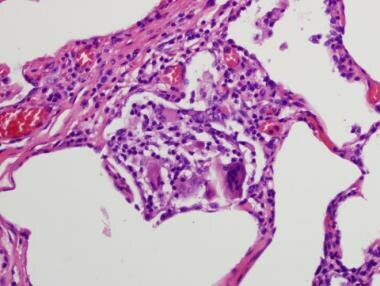 High magnification, showing a multinucleated giant cell within an interstitial chronic inflammatory infiltrate. A 46-year-old man with hypersensitivity pneumonitis. A loose interstitial granuloma at high magnification is shown. A 46-year-old man with hypersensitivity pneumonitis. 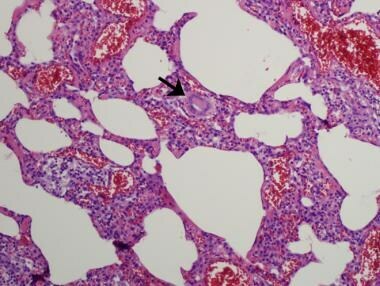 Multinucleated giant cells in chronic hypersensitivity pneumonitis often contain cholesterol clefts (arrowheads). The chronic interstitial inflammation in hypersensitivity pneumonitis is usually mild and fairly diffuse. A characteristic feature is that the infiltrate is accentuated around bronchioles. This finding (chronic bronchiolitis) may be subtle and is not always readily appreciated, since respiratory bronchioles and alveolar ducts merge imperceptibly into alveoli. See image below. A case of hypersensitivity pneumonitis in a 48-year-old woman with numerous pets including cockatiels and finches. 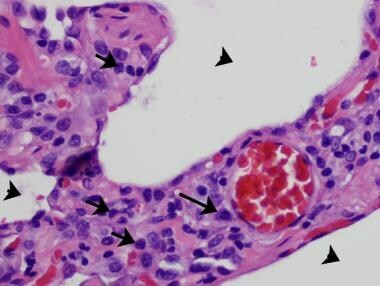 Chronic inflammation is present in the interstitium (arrowheads), but is accentuated around a bronchiole (arrow). Although chronic hypersensitivity pneumonitis is an interstitial disease, secondary changes within the alveolar airspaces are commonly present. One of these is organizing pneumonia, which manifests as the presence of scattered tiny plugs of fibroblasts within a few airspaces. 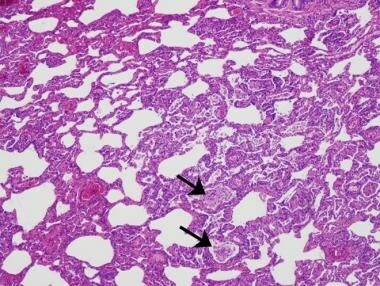 Another common finding is the presence of numerous foamy macrophages within peribronchiolar airspaces, reflecting bronchiolar obstruction upstream (proximal) to the macrophage accumulation. See images below. A case of hypersensitivity pneumonitis in a 48-year-old woman with numerous pets including cockatiels and finches. Foamy macrophages (arrow) within an airspace. A 46-year-old man with hypersensitivity pneumonitis. Foamy macrophages within airspaces (arrows), visible at low magnification. These cells can be numerous and may distract attention from the primarily interstitial nature of the inflammatory process. They are a manifestation of airway obstruction and can thus be seen in any process that involves bronchioles. A case of hot tub lung in a 48-year-old woman with dyspnea and dry cough. Organizing pneumonia in hot tub lung is shown. Two fibroblast plugs (arrowheads) are present within airspaces. It must be stressed that hypersensitivity pneumonitis is not a type I (allergic) hypersensitivity response. Therefore, despite what one might expect from the name of the disease, eosinophils are not encountered in this condition. The hallmark cell of hypersensitivity pneumonitis is the lymphocyte. 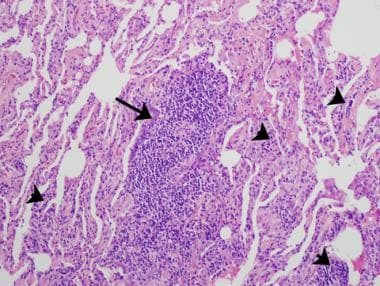 In cases with less-than-classic findings, the most that the pathologist can do is suggest the possibility of the diagnosis, keeping in mind that some drug reactions and collagen vascular diseases can result in identical histologic features. As with other conditions, knowledge of the clinical context and radiographic findings can be very useful when interpreting transbronchial biopsy findings. Even in the absence of an inciting antigen, the pathologic diagnosis can be supported clinically by lymphocytosis on BAL and typical radiographic findings (see Clinical Features and Imaging). 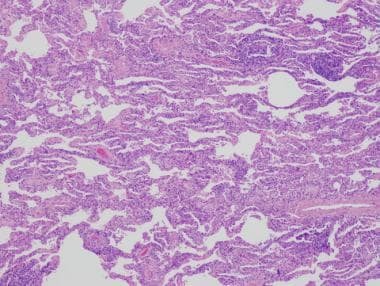 In hot tub lung, the most consistent histologic finding is the presence of granulomas within airspaces, including small membranous bronchioles, respiratory bronchioles, alveolar ducts, and alveoli. The granulomas may be accompanied by interstitial inflammation or organizing pneumonia. Granulomas may also be found in the walls of bronchioles. 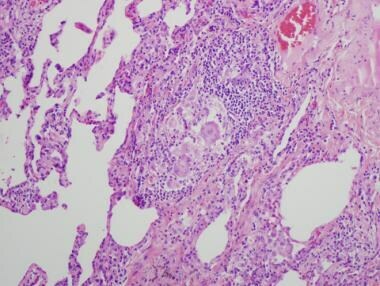 The granulomas of hot tub lung are characteristically non-necrotizing, but necrosis may be present. They are usually well formed, fairly large, and prominent. Mycobacteria may or may not be demonstrable on acid-fast stains but are not essential for the diagnosis. See images below. A case of hot tub lung in a 48-year-old woman with dyspnea and dry cough. 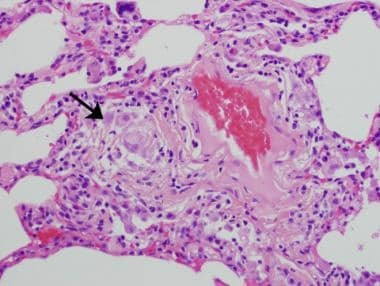 This transbronchial biopsy shows large non-necrotizing granuloma within an airspace (arrows point to alveolar septum, arrowheads are within airspace). A case of hot tub lung in a 48-year-old woman with dyspnea and dry cough. 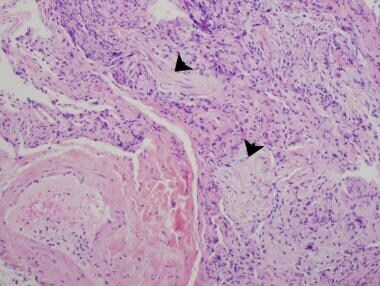 Two granulomas (arrows) are seen in this image, both within airspaces. Arrowheads outline the alveolar septa (interstitium). A case of hot tub lung in a 48-year-old woman with dyspnea and dry cough. Interstitial chronic inflammation in hot tub lung is shown. The diagnosis of hot tub lung rests on a history of hot tub use in combination with the characteristic granulomas. Ideally, MAC organisms should be isolated from cultures of respiratory tract specimens, the offending hot tub, or both. Like any inflammatory disease, the lymphocytes in chronic hypersensitivity pneumonitis are predominantly CD3-positive T lymphocytes. 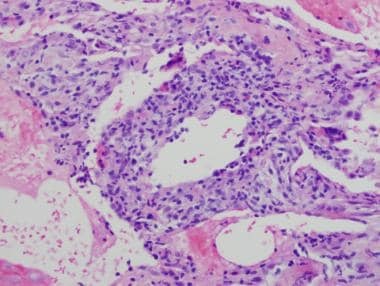 On biopsy specimens, immunohistochemistry is neither required nor routinely performed for diagnosis of hypersensitivity pneumonitis or hot tub lung. Chronic hypersensitivity pneumonitis has a slightly worse prognosis than acute or subacute hypersensitivity pneumonitis since a subset of patients with chronic disease shows progressive worsening, likely because of the development of fibrosis, which probably accounts for the small number of patients who die of the disease. In one study, median survival in patients with fibrosis was 7.1 years, while median survival in those without fibrosis was at least 20.9 years and could not be accurately calculated since more than 85% of patients were still alive at last follow-up. In the same study, the overall 5-year mortality was 27% and the median survival was 12.8 years. Hot tub lung improves or resolves in most patients upon cessation of hot tub use combined with corticosteroid therapy or antimycobacterial therapy. Some patients have been treated with all 3 modalities. Cessation of hot tub use should be the mainstay of therapy in all patients. The differential diagnoses of hypersensitivity pneumonitis include usual interstitial pneumonia, nonspecific interstitial pneumonia, hot tub lung, and cellular chronic interstitial pneumonias caused by collagen vascular diseases and drug reactions. Usual interstitial pneumonia enters the differential diagnoses if fibrosis supervenes and if other features of usual interstitial pneumonia such as scarring and honeycombing are also present. Distinguishing usual interstitial pneumonia from chronic hypersensitivity pneumonitis in such situations can be challenging. The most useful histologic clue to the diagnosis of hypersensitivity pneumonitis in this situation is the presence of a cellular chronic interstitial pneumonia typical of chronic hypersensitivity pneumonitis away from the areas of honeycomb lung. In other words, at least some areas in the biopsy sample should show chronic interstitial inflammation with peribronchiolar accentuation and scattered loose granulomas or giant cells within the interstitium. It is important to remember that granulomas in cases of usual interstitial pneumonia may be related to superimposed infection or aspiration of gastric contents (food/pill fragments). Therefore, finding granulomas in usual interstitial pneumonia does not necessarily imply a diagnosis of chronic hypersensitivity pneumonitis. Therefore, from the clinical standpoint, a pathologic diagnosis of nonspecific interstitial pneumonia or a descriptive diagnosis of "cellular chronic interstitial pneumonia" should always prompt a thorough search for a potential source of antigen exposure. A diagnosis of idiopathic nonspecific interstitial pneumonia should be made only after a meticulous clinical search for antigen exposures, underlying collagen vascular diseases, and drug toxicities. Pathologically, the features common to hot tub lung and hypersensitivity pneumonitis include interstitial inflammation, granulomas, and foci of organizing pneumonia. The distinction between the two entities lies in the relative prominence of interstitial inflammation and granulomas, the morphologic characteristics of the granulomas, and a history of hot tub use. While interstitial chronic inflammation is the most striking feature in most cases of hypersensitivity pneumonitis, granulomas dominate the histologic picture in hot tub lung. The granulomas of classic hot tub lung are large and well-formed and present within airspaces, while those of hypersensitivity pneumonitis are tiny and poorly formed and present in the interstitium. Regardless of the histologic findings, a clinical history of hot tub use is essential for a diagnosis of hot tub lung. Another consideration in patients in whom MAC or other nontuberculous mycobacteria are identified in cultures of respiratory specimens is the possibility of true infection by nontuberculous mycobacteria  unrelated to hot tubs. The histologic features in such patients can be identical to hot tub lung,  and, as in hot tub lung, acid-fast bacteria may or may not be detected on histologic special stains. In this situation, a history of hot tub use is the key discriminating feature. Katzenstein A-LA. Immunologic lung disease. Katzenstein A-LA. Katzenstein and Askin's Surgical Pathology of Non-Neoplastic Lung Disease. 4th ed. WB Saunders: Philadelphia, PA; 2006. 151-158. Griffith DE, Aksamit T, Brown-Elliott BA, Catanzaro A, Daley C, Gordin F. An official ATS/IDSA statement: diagnosis, treatment, and prevention of nontuberculous mycobacterial diseases. Am J Respir Crit Care Med. 2007 Feb 15. 175(4):367-416. [Medline]. Hartman TE, Jensen E, Tazelaar HD, Hanak V, Ryu JH. CT findings of granulomatous pneumonitis secondary to Mycobacterium avium-intracellulare inhalation: "hot tub lung". AJR Am J Roentgenol. 2007 Apr. 188(4):1050-3. [Medline]. Sood A, Sreedhar R, Kulkarni P, Nawoor AR. Hypersensitivity pneumonitis-like granulomatous lung disease with nontuberculous mycobacteria from exposure to hot water aerosols. Environ Health Perspect. 2007 Feb. 115(2):262-6. [Medline]. Morell F, Roger A, Reyes L, Cruz MJ, Murio C, Munnz X. Bird fancier's lung: a series of 86 patients. Medicine (Baltimore). 2008 Mar. 87(2):110-30. [Medline]. Hanak V, Kalra S, Aksamit TR, Hartman TE, Tazelaar HD, Ryu JH. Hot tub lung: presenting features and clinical course of 21 patients. Respir Med. 2006 Apr. 100(4):610-5. [Medline]. Vourlekis JS, Schwarz MI, Cherniack RM, Curran-Everett D, Cool CD, Tuder RM. The effect of pulmonary fibrosis on survival in patients with hypersensitivity pneumonitis. Am J Med. 2004 May 15. 116(10):662-8. [Medline]. Embil J, Warren P, Yakrus M, Stark R, Corne S, Forrest D. Pulmonary illness associated with exposure to Mycobacterium-avium complex in hot tub water. Hypersensitivity pneumonitis or infection?. Chest. 1997 Mar. 111(3):813-6. [Medline]. Agarwal R, Nath A. Hot-tub lung: hypersensitivity to Mycobacterium avium but not hypersensitivity pneumonitis. Respir Med. 2006 Aug. 100(8):1478. [Medline]. Aksamit TR. Hot tub lung: infection, inflammation, or both?. Semin Respir Infect. 2003 Mar. 18(1):33-9. [Medline]. Grimes MM, Cole TJ, Fowler AA 3rd. 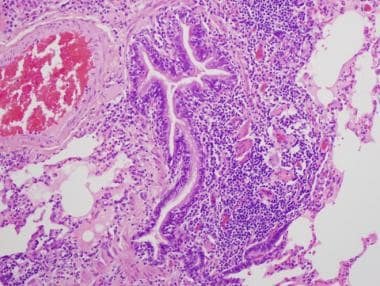 Obstructive granulomatous bronchiolitis due to Mycobacterium avium complex in an immunocompetent man. Respiration. 2001. 68(4):411-5. [Medline]. Mangione EJ, Huitt G, Lenaway D, Beebe J, Bailey A, Figoski M. Nontuberculous mycobacterial disease following hot tub exposure. Emerg Infect Dis. 2001 Nov-Dec. 7(6):1039-42. [Medline]. Pham RV, Vydareny KH, Gal AA. High-resolution computed tomography appearance of pulmonary Mycobacterium avium complex infection after exposure to hot tub: case of hot-tub lung. J Thorac Imaging. 2003 Jan. 18(1):48-52. [Medline]. Rickman OB, Ryu JH, Fidler ME, Kalra S. Hypersensitivity pneumonitis associated with Mycobacterium avium complex and hot tub use. Mayo Clin Proc. 2002 Nov. 77(11):1233-7. [Medline]. Glazer CS, Martyny JW, Lee B, Sanchez TL, Sells TM, Newman LS. Nontuberculous mycobacteria in aerosol droplets and bulk water samples from therapy pools and hot tubs. J Occup Environ Hyg. 2007 Nov. 4(11):831-40. [Medline]. Yu TC, Ahmed R, Yap E, Kumar S. Dyspnoea in a 17-year-old swim instructor: a diagnosis of hot tub lung. N Z Med J. 2008 Oct 17. 121(1284):78-80. [Medline]. Verma G, Jamieson F, Chedore P, Hwang D, Boerner S, Geddie WR. Hot tub lung mimicking classic acute and chronic hypersensitivity pneumonitis: two case reports. Can Respir J. 2007 Sep. 14(6):354-6. [Medline]. Girard M, Israel-Assayag E, Cormier Y. Impaired function of regulatory T-cells in hypersensitivity pneumonitis. Eur Respir J. 2011 Mar. 37(3):632-9. [Medline]. Lacasse Y, Selman M, Costabel U, et al. Classification of hypersensitivity pneumonitis: a hypothesis. Int Arch Allergy Immunol. May 2009. 149(2):161-6. Lacasse Y, Selman M, Costabel U, Dalphin JC, Ando M, Morell F. Clinical diagnosis of hypersensitivity pneumonitis. Am J Respir Crit Care Med. 2003 Oct 15. 168(8):952-8. [Medline]. Hirschmann JV, Pipavath SN, Godwin JD. Hypersensitivity pneumonitis: a historical, clinical, and radiologic review. Radiographics. 2009 Nov. 29(7):1921-38. [Medline]. Coleman A, Colby TV. Histologic diagnosis of extrinsic allergic alveolitis. Am J Surg Pathol. 1988 Jul. 12(7):514-8. [Medline]. Emanuel Da, Wenzel Fj, Bowerman Ci, Lawton Br. Farmer's Lung: Clinical, Pathologic And Immunologic Study Of Twenty-Four Patients. Am J Med. 1964 Sep. 37:392-401. [Medline]. Barrios RJ. 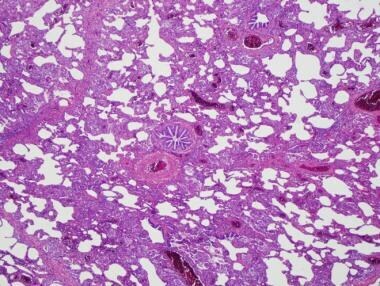 Hypersensitivity pneumonitis: histopathology. Arch Pathol Lab Med. 2008 Feb. 132(2):199-203. [Medline]. Mukhopadhyay S, Gal AA. Granulomatous lung disease: an approach to the differential diagnosis. Arch Pathol Lab Med. 2010 May. 134(5):667-90. [Medline]. Castonguay MC, Ryu JH, Yi ES, Tazelaar HD. 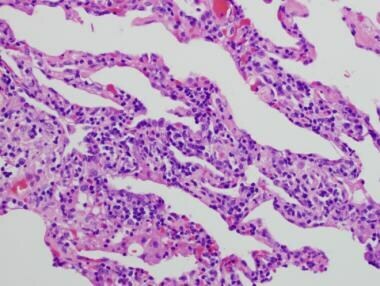 Granulomas and giant cells in hypersensitivity pneumonitis. Hum Pathol. 2015 Apr. 46(4):607-613. [Medline]. Vourlekis JS, Schwarz MI, Cool CD, Tuder RM, King TE, Brown KK. 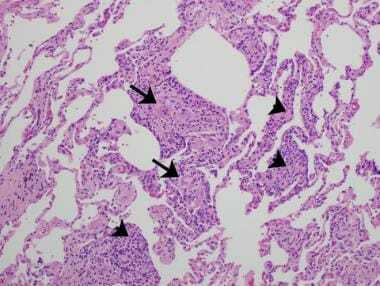 Nonspecific interstitial pneumonitis as the sole histologic expression of hypersensitivity pneumonitis. Am J Med. 2002 Apr 15. 112(6):490-3. [Medline]. Ando M, Arima K, Yoneda R, Tamura M. Japanese summer-type hypersensitivity pneumonitis. Geographic distribution, home environment, and clinical characteristics of 621 cases. Am Rev Respir Dis. 1991 Oct. 144(4):765-9. [Medline]. Cormier Y. Wind-instruments lung: a foul note. Chest. 2010 Sep. 138(3):467-8. [Medline]. Marchetti N, Criner K, Criner GJ. Characterization of functional, radiologic and lung function recovery post-treatment of hot tub lung. A case report and review of the literature. Lung. 2004. 182(5):271-7. [Medline]. Metersky ML, Bean SB, Meyer JD, Mutambudzi M, Brown-Elliott BA, Wechsler ME. Trombone player's lung: a probable new cause of hypersensitivity pneumonitis. Chest. 2010 Sep. 138(3):754-6. [Medline]. Metzger F, Haccuria A, Reboux G, Nolard N, Dalphin JC, De Vuyst P. Hypersensitivity pneumonitis due to molds in a saxophone player. Chest. 2010 Sep. 138(3):724-6. [Medline]. Miyagawa T, Hamagami S, Tanigawa N. Cryptococcus albidus-induced summer-type hypersensitivity pneumonitis. Am J Respir Crit Care Med. 2000 Mar. 161(3 Pt 1):961-6. [Medline]. Reyes CN, Wenzel FJ, Lawton BR, Emanuel DA. The pulmonary pathology of farmer's lung disease. Chest. 1982 Feb. 81(2):142-6. [Medline]. The author would like to thank Anna-Luise Katzenstein, M.D. (State University of New York Upstate Medical University, Syracuse, NY, USA) for allowing him to use a case from her consultation files for some of the photomicrographs in this article (media files 9-14).